As the climate change has been termed as the ‘greatest moral crisis of our time’ and conflicts over water continue across the world, a lost civilisation in Mizoram that turned rocks into hidden reservoirs, could hold the key to water conservation in extreme conditions. In January 2016, the Archaeological Survey of India (ASI) announced discovery of a “living history museum” at Vangchhia village in Champhai district of Mizoram, bordering Myanmar. 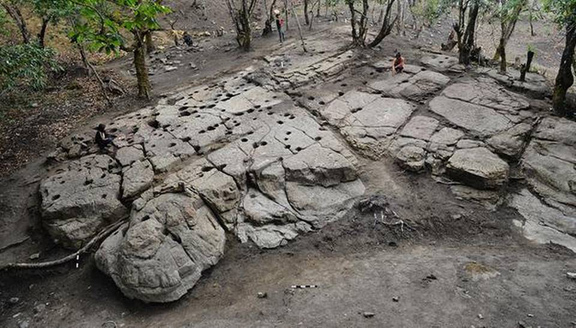 The site, measuring about 45 sq km and located 260 km from Aizawl, the state capital of Mizoram, has yielded pictographs etched on large stone slabs, menhirs — large standing stones — and a necropolis — a large cemetery — among other artefacts, reports The Hindu. It has been reported that the area is part of the Lower Himalayas, and has rows of steep hills largely made up of various kind of sandstone shading from light grey to blackish. The ancient villagers of Vangchhia carved terraces on these rocks for their settlement. The main excavated site consists of 15 such terraces. There’s is a water pavilion and strategically drilled holes — between one feet and one metre across — spread over several sandstone slopes in this village which drew attention of the the attention of the archaeologists. The report quoted ASI researchers as saying that the grey sandstone is softer and home to the holes while the harder black rock is used for menhirs. The researchers within two years of study since the discovery of the Vangchhia site reportedly arrived at some theories behind the “seemingly simple science” of water harvesting, perfected several centuries ago, which could sustain local populations for at least a year. Nayan also said most of the ethnic groups that inhabited these areas were at war, and the possibility of raiders poisoning water reservoirs or stealing water could have made locals devise this strategy to dissuade those not familiar with the topography. It seems water harvesting to be at the heart of the activity with the nearest river, the Tlau, located 12 km away. The archaeologists, however,. have not been able to accurately date the Vangchhia settlement. An ASI team recently discovered neolithic caves near Vangchhia which indicates that the lost civilisation could be much older.